This cake is light and creamy i just added custard on top of the angel food cake so the eggyolks wont go to waste. over low fire melt sugar in the cake pan til it is golden brown.swirl the melted sugar til bottom of the pan is totally covered. set aside and let cool. beat eggyolks til it is light and creamy add condensed milk,water,vanilla and lemon zest blend well and strain over caramelized sugar. set aside and prepare angel food cake batter. 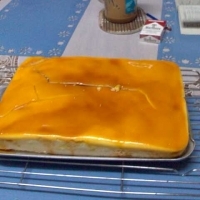 Pour Lemon Angel Food Cake batter slowly over the custard mix.Bake for 40 minutes in a larger pan with water (bain marie) or until toothpick inserted on the cake comes out clean let stand for 30 minutes on the pan wth water before turning it upside down. il try making them today!! Bravo.I like these genius recipes. Sounds great! You can bake for me anytime! Like s01105's recipes? Never miss an upload!